I’m watching the day break as I type this. It’s going to be beautiful! Not a whisp of fog to be found. You’ll need some sunscreen if you’re outdoors today and no doubt you’ll want to have the windows open and shades drawn to keep the house cool! Looks like we’re in for a beautiful rest of the week and weekend. It’s that time of year again.. I’ve switched the webcam to its wintertime view. If you’re wondering why, it’s because in it’s south (city facing) orientation, during the winter the sun enters the picture and promptly burns a track into the CCD sensor of the camera. Trust me, it’s not fun. 🙂 One day when I have more cash I’ll be buying a camera that has some special software that can effectively block the suns disk (by turning off parts of the sensor) and save the CCD sensor. And finally… we had a wonderful event at the Harbour Quay yesterday! 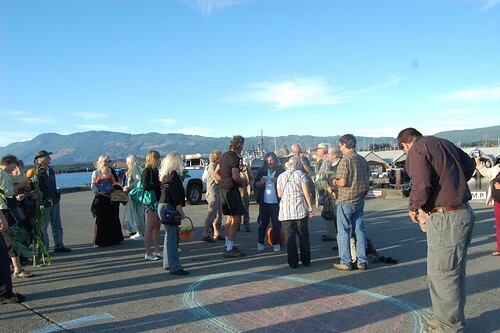 There were 30-35 of us gathered to send a wake-up call to our politicians on Climate Change. We phoned James Lunney, Scott Fraser and Prime Minister Harpers Office and got through to the first two but the PMOs voicemail was full (a good sign I think). You can see a few of our pictures (search for Port Alberni) in the global photostream on flikr here. Wow, at 10:30pm tonight, Ucluelet is actually warmer than Port Alberni! We clocked 18C and slowly climbing, while I see Alberni was at 15.4C. I was out doing weather obs for work when I noticed it was quite warm. Even the wind was warm! Looks like some pretty serious inversion this morning in the Valley!